I would like to remind everyone that we will be hosting our annual tournament and birthday celebration for Supreme Master Kim this Saturday, December 8th. Please note the address change from the posters and flyers at CMA. The tournament is being held at the Fairbridge Inn and Conference Center, 130 Route 10 West, East Hanover, NJ. Therefore, we will have no classes at CMA on Saturday. There is still time to register for the tournament and we need more competitors. 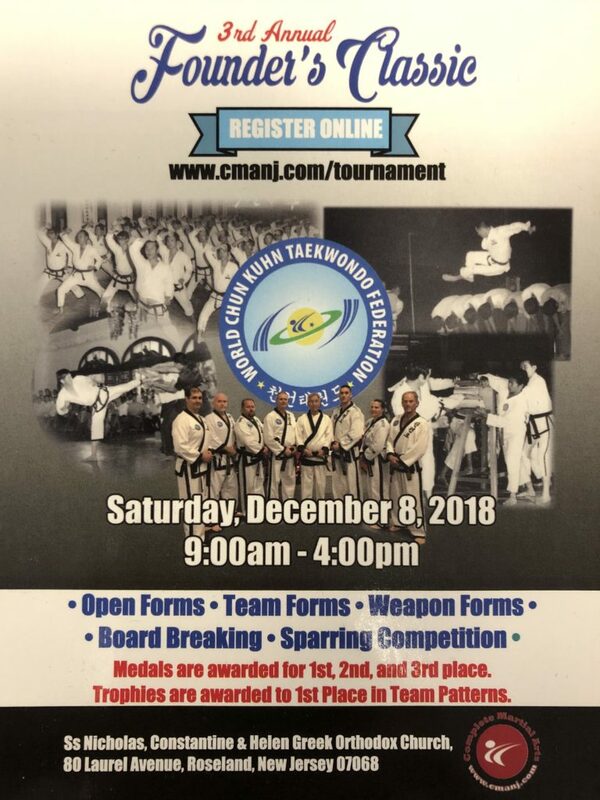 You can register online at www.cmanj.com/tournament. Competition for ages 8 and over begins at 9am sharp and will finish before noon. You can arrive up to 30 minutes early to warm up and stretch. At noon we will have Chun Kuhn Taekwondo demonstrations and performances by traditional Korean dancers and musicians. There will be a break for lunch around 12:45 and there will be sandwiches and snacks available for purchase. Competition for ages 7 and under begins at 1:30pm and will end by 3pm. I am looking for parents and/or family members who can volunteer to help at the tournament. There are several committees that need volunteers. If you are interested in joining a volunteer committee please respond to this email and let me know what hours you are available. There will be a mandatory demonstration rehearsal this Friday at 6:45pm at the Fairbridge Inn. We will run through the demonstration routine a few times. I will provide pizza and refreshments for all who attend.